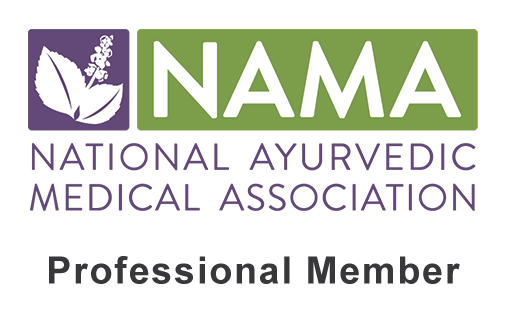 A question I get asked a lot in my Ayurvedic practice is “what does Ayurveda say about eating smoothies?”. After announcing the “bad” news that an Ayurvedic diet highly recommends the avoidance of smoothies, the next question is often, “I love my smoothies, is there any way around this?”. Luckily it is not all a black and white matter, and there are often steps we can take to avoid the unhealthy nature that accompanies most smoothie recipes. So why does Ayurveda state that smoothies are not healthy? This partially has to do with the fact they often contain incompatible food combinations, high caloric value and excessive sugar content. Smoothies also possess the qualities of being raw, cold and rough making them heavy by nature, hard-to-digest and Vata-provoking. Eating smoothies with these properties consistently will surely lead to a sluggish digestion (manda agni), fermentation in the gut and toxic accumulation. 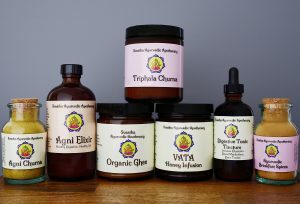 If you are reading this and are ready to swear off your Ayurvedic diet as you are not willing to part with your morning smoothie, then you will be happy to hear that there are some precautions we can take to make our smoothies much more healthy, a bit lighter, and easier on the digestion. I have come up with a list of remedies to balance out the unhealthy nature of the average smoothie recipe. Ideally you will want to apply as many of these recommendations as possible in order to get the most health benefits from your smoothie. Don’t miss our Ayurvedic Smoothie Recipe at the bottom of the page! 1. Use herbal tea as a base. Smoothies tend to contain high amounts of sugar, partially because they often use fruit juice or a sweetened nut milk as the base. This can lead to excessive calories, blood sugar instability and energy crashes soon after consumption. For these reasons, it is important to reduce the sugar content as much as possible. Of course you can always add water as a base; however, if you are looking for something a bit more flavorful, an amazing option is to use an herbal tea of your choice instead. This not only will create more flavor, but will add in some great health benefits as well! Some tasty herbal tea options include tulsi, ginger, lemongrass, chai, rooibus, rose, hibiscus or chamomile tea. If you find a tea blend that you enjoy for your smoothie recipe, make a large batch to store in the fridge for easy use. If you prefer a pre-made herbal tea blend I really enjoy the Healthy Digestion Tea, COOL DOWN Tea or the Ayurvedic Spiced Chai in my smoothies! Click here for our entire herbal tea collection. 2. Stay away from improper food combinations. One of the main reasons why smoothies are so bad for the digestion is the incompatible food combinations that often accompany them. For example, fruit is meant to always be eaten on its own, making it a bad combination when blended with yogurt, milk, nuts, veggies, or the like. If you are using fruit for your smoothie recipe, then it will be essential to keep it simple and avoid adding in these other ingredients mentioned. If you are looking to bulk up your smoothie a bit with something other than fruit, a few options that will not be as detrimental would be adding in avocado, coconut (which is technically a fruit), or seeds such as chia, flax, hemp, or pumpkin seeds. If you are yearning for that healthy green glow in your smoothie I would suggest adding in a green powder such as spirulina or our super greens formula, as these will be easier to digest than raw kale, spinach, collard greens, etc. Click here for more information on Incompatible Food Combinations. 3. Avoid adding in hard-to-digest protein powders. Since the goal for our healthy smoothie recipe is to make it easier to digest, another factor will be to avoid protein powders. Due to their dry, highly processed nature they are not often recommended in Ayurveda and they definitely should be avoid when taken with fruit (which makes them hard-to-digest and an incompatible combination). If you are needing some protein in your smoothies, I would recommend trying out some seed proteins (using the whole seed rather than a processed powder) such as chia, flax, hemp, or pumpkin seeds. 4. Add warming spices to help aid in digestion. What better way to lighten up a heavy recipe than with some digestive spices. Since smoothies are sweet by nature, it would be most recommended to use some sweet, aromatic options such as cinnamon, cardamom, nutmeg and/or ginger. Although not sweet, I really enjoy adding turmeric as well and rarely ever make a smoothie without it! 5. Add in some coconut oil (or other healthy fats) for digestive support. Another great way to add a bit of digestive support and reduce Vata-provokation is to use some healthy fat(s) in your smoothie recipe. Fat not only provides essential nutrients to our bodies, but it will help make the dry, rough quality of the smoothie more moist, consequently aiding in digestion. Some great options for this would be coconut oil, ghee, flax seed oil or an avocado. 6. Only eat smoothies during the hot seasons, avoid them in the fall and winter months. It is always best to eat with the season, and this holds especially true for smoothies. Eating raw, cold foods that are both Kapha-provoking (due to their heavy, thick and sticky nature) and Vata-provoking (due to their raw, cold, dry and rough nature) during the seasons that are already predominant in these doshas will only provoke them further in your system. This will increase symptoms such as coldness, poor circulation, constipation, dry skin, gas, bloating, anxiety and insomnia in the fall, and congestion, slow digestion, sluggishness, laziness, fatigue and depression in the winter season. Therefore the best time to eat smoothies will be in the late spring and summer season, as cold, raw food is better tolerated during these months. 7. Aim for room temperature smoothies, never eat them ice-cold! Even in the hotter months, one should avoid consuming ice cold food and beverages. Eating foods at extremely cold temperatures makes them harder to digest, but also weakens the digestive fire by literally putting it out. Therefore a smoothie (which is already harder to digest) should always be eaten at room temperature or warmer. This can be accomplished by not adding in ice and avoiding frozen fruits. Adding in warming spices as mentioned above will naturally add a warmth to the smoothie as well. 8. Keep it simple, don’t use too many ingredients! When I ask my clients about their current smoothie recipe, more often than not there is a long list of ingredients that they throw at me. Although the ingredient list tends to be all very healthy (nuts, seeds, yogurt, fruit, kale, supplements, etc), when they are all taken together in one large blended drink, their healthy properties become overpowered by the heavy, hard-to-digest nature that results. Further, it is hard to blend so many ingredients together without creating some incompatible food combinations, especially when fruit is almost always in the mix. Therefore to keep things simple, it will be best to aim for a limitation to the ingredient that are added to your smoothie. For example, stick to 1-2 fruits, 1 seed, 1 healthy fat, water or herbal tea base and spices. The easier to digest the smoothie, the better you will feel after, the better your body will absorb the healthy nutrients, and the less likely you will experience the negative symptoms that can come about (gas, bloating, heaviness, toxins, etc) from an overly complicated smoothie. 9. Eat in moderation, avoid eating smoothies daily. As they say, too much of a good thing can easily become harmful. Even if you follow all of these tips to a T, I would still highly recommend to avoid the daily intake of smoothies. This is because they will still possess the unwanted qualities that we are trying to avoid, just with a lighter blow. They will still likely have a decent amount of sugar and calories, be harder to digest (relatively speaking), and have the raw, cool properties related to them. Therefore, I would aim for no more than 3 smoothies in a week during the warmer seasons and avoiding them altogether in the colder months. 10. Eliminate smoothies completely during times of severe Vata or Kapha imbalances. If you are currently experiencing a severe Vata imbalance such as anxiety, insomnia, severe gas and bloating, constipation or irregular weak digestion, it would be best to avoid smoothies until the symptoms have subsided and your Vata has returned to its normal state. Instead one should focus on a more appropriate Vata-reducing diet that consists of warm, moist, well-cooked foods. Read more about a Vata-Reducing Diet here. 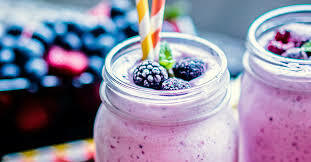 Similarly, if there is a severe Kapha imbalance occurring such as congestion, chronic sinus infection, sluggish digestion, lack of appetite, slow metabolism, obesity, hypothyroidism, chronic fatigue or depression then it will once again be best to avoid smoothies until balance has been restored. Instead one should focus on a more appropriate Kapha-reducing diet that consists of warmer, lighter foods with less sugar. Read more about a Kapha-Reducing Diet here. 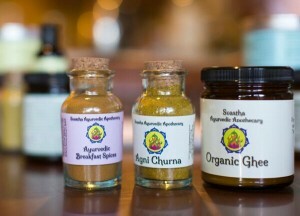 *These spices can be replaced with 1/2 tsp of our Ayurvedic Breakfast Spices. Place all of the ingredients into a high-speed blender. Blend on high for 2-3 minutes or until a smooth consistency is created. Drink and enjoy, 2-3 days a week during the late spring or summer season. Also try our delicious Turmeric Milkshake Recipe (Dairy-Free)!